Bangkok (Thailand) – May 13, 2018 (travelindex.com) – The Management of Azimut Yachts Thailand, sole authorized dealer of Italy’s renowned Azimut Yachts in the country, recently announced the arrival in Thailand of Azimut 77S – a gutsy, state-of-the-art craft with ultimate charm and elegance, and a champion of low fuel consumption – belonging to the distinctive Azimut S sports yachts Collection. Making its debut at the recent Cannes Boat Show in September 2017, the Azimut 77S once again displays the vertical bow and the steel shield of the Azimut 55S, a true commercial success story with over 40 crafts sold since its launch two years ago. 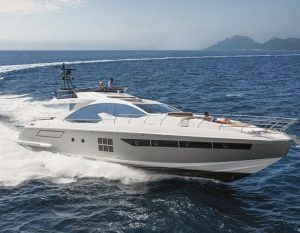 The 77S, spotting many of the distinctive features of the Azimut sport yacht range is poised to match the success of the Azimut 55S, with four boats ordered even before the official launch. The Azimut 77S is family and group excursions friendly boasting two very spacious open air living areas on board: The traditional aft cockpit with a sunbathing area of 8 square metres, a dining table for as many as eight and a kitchen-bar area with a BBQ, refrigerator and icemaker. The fore cockpit is an eating and relaxation area with an eight person sofa, a coffee table and all the space needed to relax in the sun or in the shade thanks to an electrohydraulic bimini cover. The main deck with its two large windows and the vast crystal entrance door as well as the sliding glass roof is open to natural light. The design and décor highlighting gloss Zebrano wood essences and leather details are all produced by the best Italian craftsmen. The lower deck comprises the master suite with bulwark windows offering a breath-taking view over the water, a large bathroom and a walk-in wardrobe, two guest cabins laid out in a traditional way with separate beds and over 6 feet 6 inch high ceilings. The spacious and functional kitchen with storage space large enough for medium to long range cruise completes the picture. “The new Azimut 77S is ultimately not just a study in excellence in terms of design and functionality, but also a technological marvel, made possible thanks to the long standing experience and research that has gone into Azimut Yachts; and on behalf of the Management of Azimut Yachts Thailand, we are indeed very proud and honoured to be associated with such a distinguished brand in the world’s nautical industry,” said Mr. Chanyo. “With this latest, yet another spectacular Azimut model, we shall continue to strive to augment Thailand’s position as one of Asia’s fastest growing yachting and cruising grounds in this region,” concluded Mr. Chanyo.